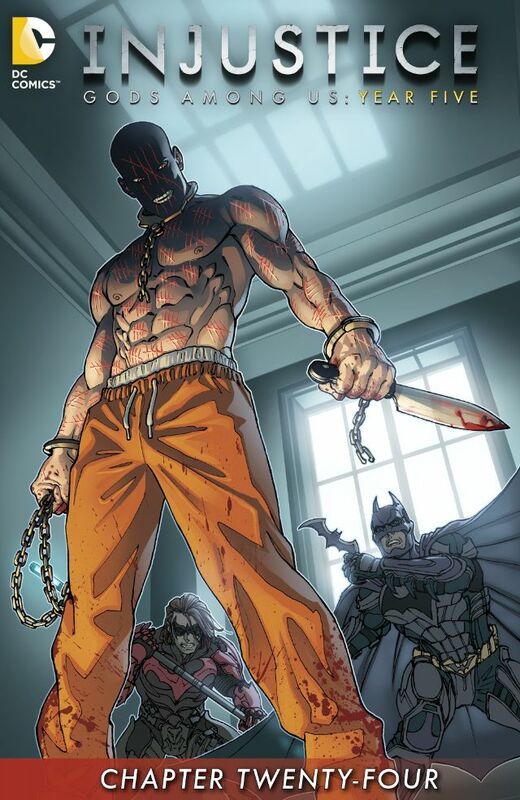 Batman tracks down Zsasz and proceeds to beat him for information as to who put him on to kill Alfred. Zsasz doesn't divulge a word and taunts Batman, when Damian shows up to kill Zsasz. Story - 1: Is it ironic when a story is extended so it can be decompressed further? Injustice normally concludes at this point, but it continues on, because there is no mercy for this critic. There can only be so much time between Alfred's murder and Batman's appearance. Instead of being treated to a show of his superior detective skills in locating Zsasz, which would be a feast for the famished at this point, readers are shown Batman magically appearing where Zsasz is, and the perfunctory beat down of he villain, where we wonder if he'll kill him or not (don't worry, he won't). Damian shows up to put forward the obligatory ultimatum... and it's all so uncompromisingly boring. We are right back where we started where a Batman villain kills someone of import, and we have to watch the connected character react to it. Dull, dull, dull. We still haven't seen any resolution to Regime Superman's loss, and so this reversal falls flat. I guess Regime will show up next issue, he'll fight Batman, yadda yadda. Art - 4: Zsasz looks like a cowardly punk. Excellent. Cover Art - 3: Zsasz can count this issue as another notch.